APA Style is a set of conventions and standards for written communications put forth by the American Psychological Association. These standards allow for ease of communication between authors and readers, similar to the way physicists or mathematicians use universal symbols to make communication easier. APA Style is primarily used in academic settings for research papers among university students and faculty. Why Should I Use APA Style? As with anything you write, you must keep you audience in mind. Who will be reading your work? In APA Style, you will find a set of conventions that, when adhered to, allow for the ease of communication. Using one set style type allows readers to navigate their way through your work with ease and follow your arguments, citations, and source materials. Can you imagine if every researcher in a given discipline used a different method of source citation? Think of all the wasted time the reader would spend just trying to understand the organization of the paper, let alone the arguments being put forth. The APA Style allows for a consistent, uniform presentation of a paper’s findings so that the maximum amount of time can be spent on the content, not the formatting. APA Style is primarily used in the social sciences but is also used elsewhere. All major styles have formatting requirements for how the text should appear on your page. This allows for ease of reading and a consistent experience across papers. Page numbers should be set at one-half inch (1.25 cm) from the upper right hand corner and flush with the right margin. The running head of the paper should be set one-half inch (1.25 cm) from the upper left hand corner and flush with the left margin. 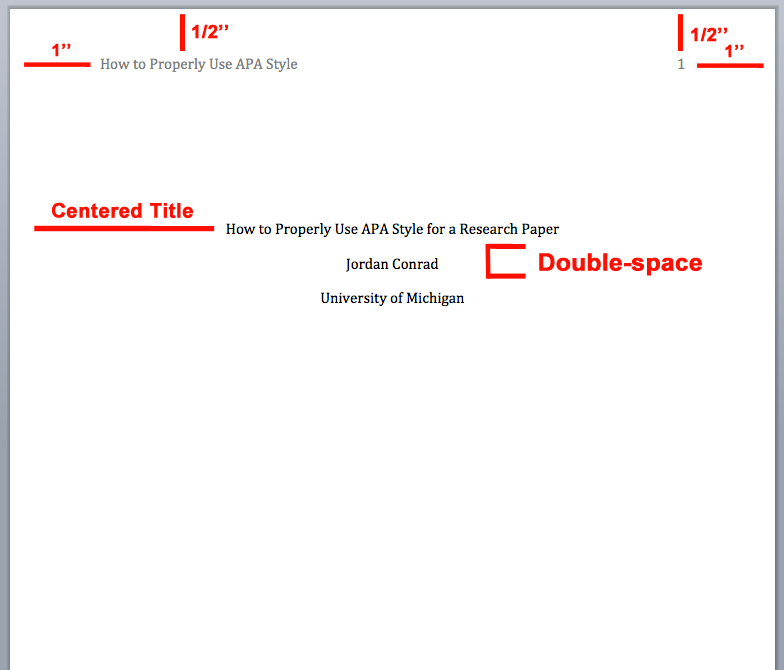 Except for the running title and pages numbers, the margins on an APA Style papers should be one inch at the top and bottom and on both sides of the text. The first word of every paragraph should be indented one-half inch from the left margin. This can be accomplished in Microsoft Word and other word processors by hitting the “tab” key. When writing a paper in APA Style or any other style, you should always choose a font that is easy to read. You also want to pick a typeface that has a clear contrast between its regular and italic style. APA Style prefers using Times New Roman, but if your instructor specifies something different, follow his/her guidelines. Next you will want to pick a standard size to use, 12-point font when using APA. Again, if your academic department or teacher has its own standard, use that. Your paper should be double-spaced throughout its entirety, including quotations, notes, and onto your references page, and appendix. Finally, leave one space, not two, after each period or other concluding punctuation mark unless your teacher prefers otherwise. Unlike MLA Style, which has an optional title page, APA Style requires all research papers to feature a title page. As such, they also have specific formatting requirements for how that title page should look. The running head is an abbreviated version of your title that will be at the top of every page of your paper. It should be set one-half inch (1.25 cm) from the upper left hand corner and flush with the left margin. The top of your title page should also include a right-aligned page number, which will always be “1” since this will be your first page. Your paper’s title should be a few spaces down on your paper and centered. Underneath the title, list your name and institutional affiliation. 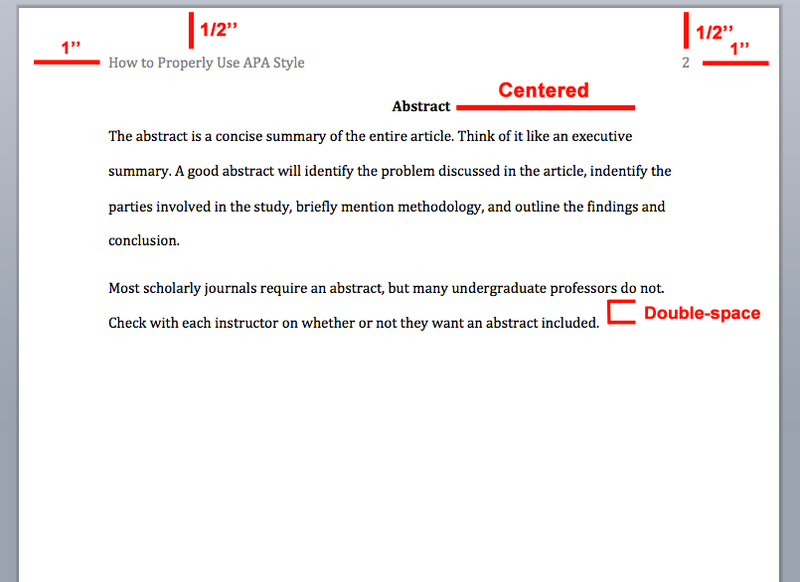 APA Style recommends that your title be less than 12 words. Do not use a period after your title or after any of the headings in your paper. The last item to be included on a title page is the author’s note. The author’s note appears with printed scholarly articles. It identifies the author’s departmental affiliation, provides acknowledgements, states any disclaimers or possible conflicts of interest, and provides contact information for the reader. The author’s note is different than the abstract and is generally not required on student papers. If you are an undergraduate student, default not to include an author’s note. The abstract is a concise summary of the entire article. Think of it like an executive summary. A good abstract will identify the problem discussed in the article, indentify the parties involved in the study, briefly mention methodology, and outline the findings and conclusion. Most scholarly journals require an abstract, but many undergraduate professors do not. Check with each instructor on whether or not they want an abstract included. Your paper should be double-spaced throughout, and on all text pages, the running head of your paper should appear as seen below. Place page number on all pages, including cover page. Page numbers should be one-half inch from top right of paper and flush with the right margin. Each page on your paper should have an ordered number in the top right hand corner, one-half inch from the top and flush with the right margin. This includes your cover page. Also, appearing flush with your left margin should be the shortened title of your research paper. If you do not have a shortened title, include the first few words or your regular title. 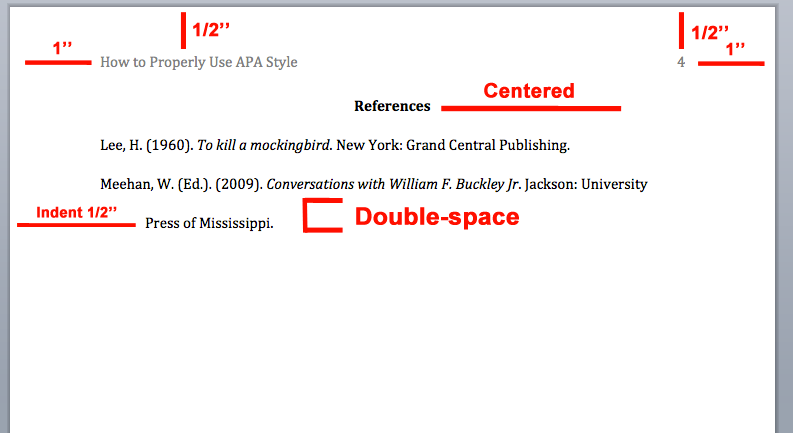 In APA Style, single and one-and-a-half spacing is acceptable in tables. Any tables or figures mentioned in text should also appear in a separate section following the references page. Properly documenting your sources is extremely important. Not only does it avoid accidental plagiarism, but it also allows the reader to see whom you are referencing. In APA Style, you cite your sources with parenthetical citations in your text that reference a chronological list that follows your research paper called a references page. These parenthetical citations are called “in-text citations” and there are a few ways you can do them. In APA Style the in-text citations provide at least the author’s last name and the year of publication. If you are not directly quoting the material or if you are referencing an entire book, article, or other work, you do not need to include a page number. However, if you are using direct quotes or paraphrasing a material, you should include a page number. The examples below will include page numbers. This idea is nothing new and has been talked about for years (Smith, 2005, p. 87). This idea is nothing new and has been talked about by various authors such as John Smith for years (2005, p. 87). This idea is nothing new and has been talked about for years (J. Smith, 2005, p. 87). This idea is nothing new and has been talked about for years (Smith & Colson, 2005, p. 87). This idea is nothing new and has been talked about for years (Smith, Colson, & Brown, 2005, p. 87). This idea is nothing new and has been talked about for years (Smith et al., 2005, p. 87). This idea is nothing new and has been talked about for years (Title of Book, 2005, p. 87). This idea is nothing new and has been talked about for years (Smith et al., 2005; Johnson et al., 2009). This idea is nothing new and has been talked about for years (Smith, 2005, 2009, 2011). Footnotes are minimally used in APA Style to provide additional content or to acknowledge copyright permission status. They are not used for citations. Entries are in alphabetical order by authors’ last name, or by title for sources without authors. Author’s first name is always reduced to initials. Entries should be double-spaced and have a period at the end. Use the ampersand “&” instead of “and” for entries with multiple authors. Use p. or pp. to abbreviate paper number. The first line of an entry is flush with the left margin. If an entry goes on to two lines, indent it one-half inch. In APA Style titles of articles in a newspaper or online are treated just like a sentence. Only the first word is capitalized. If there is a colon, the first word after colon is also capitalized. Proper nouns are capitalized too, just like a sentence. Below are specific examples and guides you can use for creating your own citations from sources in the following mediums. Author Name. (Year of publication). Title and subtitle. City of publication: Name of publisher. Lee, H. (1960). To kill a mockingbird. New York: Grand Central Publishing. If the book was produced by an organization, not an individual, list the organization as the author. Lee, H. (2009). To kill a mockingbird [Kindle edition]. New York: Grand Central Publishing. (Original work published in 1960). Lee, H. (2009). To kill a mockingbird [PDF e-book]. New York: Grand Central Publishing. If the book you are citied is an updated or revised edition, include this information between the title and the publication facts. Sowell, T. (2015). Basic of Economics (5th ed.). New York: Basic Books. If you cite one book from a group of books (called a multivolume work), list only the specific volume that you consulted. Byrne, M. S. C. (Ed.). (1981). The Lisle letters (Vol. 4). Chicago: University of Chicago Press. If you only need to cite a single chapter in an anthology, use the below method. This basic method works for citing a letter in a collection, a short story in a collection, a single poem in a collection. with William F. Buckley Jr. (pp. 99-118). University Press of Mississippi. If you are citing an introduction or preface to a book that was written by someone other than the book’s author, cite it separately. Author’s Name. (Date of publication in Parenthesis). Title and subtitle. Journal Title, Volume number, Page number. If you obtained access to a print journal through an online database, include information for the print edition, followed by the database (in italics). If there are no page numbers, use “n. pag.” instead. Matarrita-Cascante, D. (2010). Beyond growth: Reaching tourism-led development Electronic Version. Annals of Tourism Research, 37.4, 41-63. Research, 37.4, 41-63. Retrieved from JSTOR database. For print magazines, do not include article or issue numbers, even if they are given. If, in the magazine, the article is interrupted by other content, list all pages. Salam, R. (2013, October 14). Bill de Blasio’s New York. National Review. 17-20. For print, include all pages numbers, with letters identifying sections, if available. Wei, L. (2015, March 1). China rate cut renews economic concerns. The Wall Street Journal, B1, B2. Internal Combustion Engine. (2004). The world book encyclopedia. Chicago: World Book. Websites don’t follow the same rules as some of the other traditional sources from above do. Given this fact, you may need to improvise at times, doing your best to still supply the same kind of information that is required of a traditional publication. Publication Manual of the American Psychological Association, 6th Edition. A Writers’ Reference, 7th Edition by Diana Hacker. 1 What is APA Style? 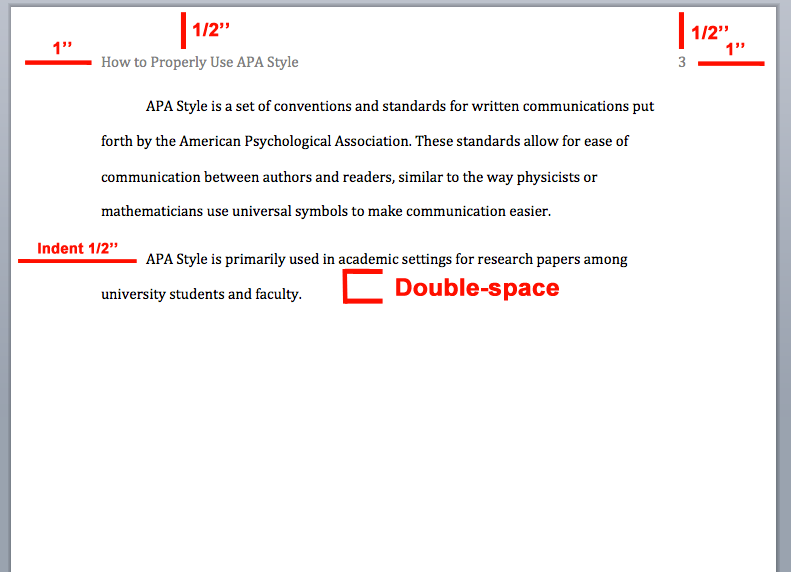 2 Why Should I Use APA Style? 3 Who Uses APA Style?